She holds his PhD in Education from the University of Granada (Spain) and Tor Vergata University (Rome, Italy). She received her Master’s in Research and Innovation in Curriculum and Teacher Training. 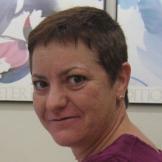 She has published on learning and teaching in online and blended learning contexts. She is interested in communication processes in Higher Education to facilitate learning anywhere, anytime. Another line of interest is leadership in virtual environments based on collaboration and analysis of the development of citizenship in Higher Education.